As The Mikado had been the last opera recorded before the war, the new series of recordings after the war began instead with Trial By Jury (1949), which had only been recorded once before. The recordings came out with unprecedented rapidity after that, with Pinafore in 1949 and Pirates, Mikado, Gondoliers, Ruddigore and Yeomen in 1950. All of these sets were issued first on 78's, with LP's following shortly thereafter. In America, they were also issued on 45's. The remainder of the series was issued on LP only, including Iolanthe and Patience in 1952, The Sorcerer in 1953 (the Company's first complete recording of the opera) and Ida in 1955. Martyn Green left the Company after Patience and was replaced by Peter Pratt for the last two of these. D'Oyly Carte's monaural series featured, on most of the sets, Martyn Green in the comic part, Leonard Osborn the tenor, Richard Watson (later Fisher Morgan) the "heavy" baritone, Darrell Fancourt the bass, Ella Halman the Contralto, Muriel Harding or Margaret Mitchell the soprano, and Joan Gillingham or Ann Drummond-Grant the soubrette. The principal attraction here is, of course, Green. Many G&S fans grew up on these recordings and regard them with great fondness. Ella Halman also gave strong performances, as did Richard Watson and Darrell Fancourt (recording most of the operas for his second or third time). On the other hand, the series is marred by Leonard Osborn's tenor and Ann Drummond-Grant's soubrette. By all accounts, Osborn was an excellent actor, especially in the "nautical" parts. Regrettably, little of that comes across on records, where his tone sounds particularly nasal and strained. Drummond-Grant never played the soubrette parts on stage, and the only explanation for her doing so on records is that she was Mrs. Isidore Godfrey. The recordings of this period were made with a cramped acoustic that is clearly inferior to those of just a few years later. They were also made very quickly. The nine sets recorded from 1949-51 are quite remarkable, when one considers that the Company was operating its regular full touring schedule at the same time. This prodigious pace obviously forced some compromises. For example, when Leonard Osborn fell ill after having recorded just twelve measures in the 1951 Patience, he was replaced by Neville Griffiths, but the twelve measures were not re-recorded with the new tenor. I have always felt that the Decca/London mono recordings were very hastily done, maybe even virtual run-throughs. The Osborn-Griffiths situation is clear evidence (redoing only twelve measures would have cleaned that up). There is a nasty splice in the Pinafore recording in "A British tar." Also, it is apparent that although they must have been recorded on magnetic tape, issue in the U.K. on 78's was the primary consideration: my Ace of Clubs reissue, at least, reveals this with the gap between sides showing at Mabel's entrance (requiring a slight musical rewrite) in Act I — the same side change, by the way, made on the 1929 HMV recording. Apparently, the reason for the quick succession of recordings around 1950 was that Bridget D'Oyly Carte wanted to get as many royalty payments as possible from the operas whilst they were still in copyright. It has been reported that the 1950 Mikado was made in a single day! Also, Trial, Pinafore, Pirates and Yeomen from this series were originally made on 78 matrices and not magnetic tape. Early LP master tapes were dubbed from 78 metal work. The Pirates recording from this series was re-issued on LP in the UK at the end of the 1970s (in mono). In this re-issue, 78-sourced background rustles can be heard. The remainder of this 1949-55 series was re-issued at the same time, excluding all the 78-sourced ones I've mentioned above. Apart from Pirates, therefore, only the ones originally done on tape were chosen for re-issue. However, these issues, unlike Pirates, were done in reprocessed stereo, fashionable in the UK in the 1970s for mono recordings. These should be avoided like the plague. The original quality, often considered outstanding in its day, was degraded in the interests of putting the word "stereo" on the label and often sounds very hollow and edgy. On the whole, I hold a higher opinion of the 1950s D'Oyly Carte recordings, particularly with Martyn Green's breath control, which I find unparalleled, and his balancing of speech and singing, to me, are most natural. One of your correspondents doubts that anyone who knows Leonard Osborn only on record would think highly of him. I'm one listener who does. There is a strength and gutsiness in his singing that I like, a kind of masculine swagger. His voice isn't really beautiful but is strong, sounds well-trained and (usually) well-produced. The lower-lying parts suited him better. 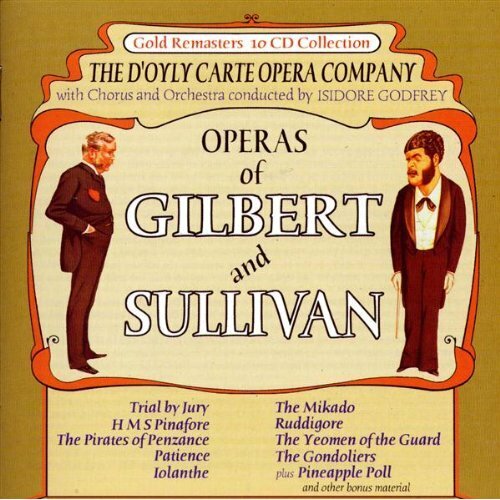 In Ruddigore, Mikado, and Iolanthe I find him excellent. In Pinafore and Pirates he seems to be in poor voice; had the recordings not been made in such a hurry they would certainly have re-recorded those choked high notes. The 1955 Princess Ida, with Osborn and Thomas Round, does, I think, very well in the tenor department. A word also ought to be said for Fisher Morgan's Private Willis in Iolanthe (the best I've ever heard) and Margaret Mitchell's glorious voice in Mikado and Ruddigore. As these recordings come out of copyright, they are starting to be issued on CD by the independent labels. At this writing, Trial, Pinafore and Pirates are available on CD, with more to come next year. Yet, Decca has ignored them. From Decca's point of view, because they date from after the war, they are not considered "historical." Yet, because they are monaural, they are considered inferior to the stereo recordings that would come later. During the 1960s, they were re-issued on the budget Ace of Clubs and Richmond labels, and in effect they competed with D'Oyly Carte's own full-price stereo recordings. 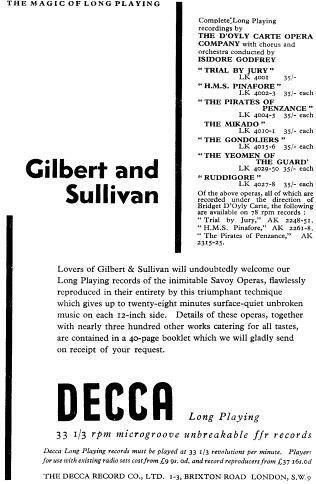 But today, with G&S recordings available from so many sources, Decca evidently have concluded that the market will bear the re-issue of only one "modern" D'Oyly Carte recording per opera. Invariably, the stereo recordings with John Reed have been the ones chosen.